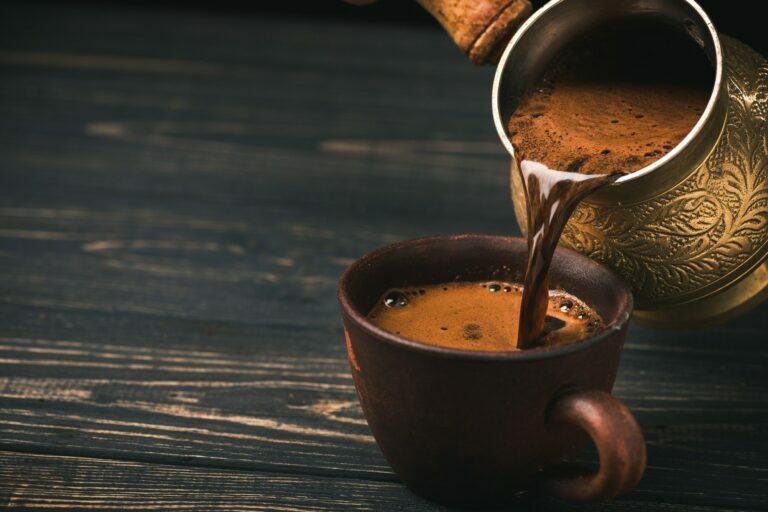 This page features information and articles about serving sets, which are of course a huge part of coffee culture, both here in the North America and particularly in the middle and far East, where they have always taken the presentation and ritual of coffee very seriously. The result of such reverence for coffee serving is often exquisite serving sets that are both hand crafted and highly detailed, as you will see from some of these articles. Serving sets include, but are not limited to, things like demitasse cups, trays, small pots, not to mention milk and sugar dishes. Some manufacturers go for simple and functional, while others go for decorative and elaborate. Stay with us to get an idea of what is available in the realm of coffee serving sets and take your coffee presentation to a whole new level! Why do I need a good serving set? How much do the serving sets cost? So, why would you need a good serving set? Anyone who has been to Turkey will tell you that Turks take their coffee-drinking very seriously. For most of them, coffee is much more than a type of a brew. Coffee is a part of their daily lives and serves as a mean of socialization, which keeps their social lives vivid and alive. Turks won’t simply brew a cup of espresso and drink it in a rush. Instead, they will spend some quality time preparing their world-famous Turkish coffee. They will not only spend extra time making their favorite brew but also serving it in a unique way. You can tell how important coffee is for Turkish people by just looking at a Turkish serving set. Turkish coffee is usually served in amazingly-looking serving sets that will make you speechless. Turkish serving sets are usually made of different types of metals. The most common metals used for crafting Turkish serving sets are brass, copper, solver, and even gold. The sets are mostly handcrafted using traditional tools. They are usually covered with fine details and decorations. The details are truly amazing, making these sets tiny pieces of art. It is worth mentioning that these serving sets can be used for serving anything you like, from coffee, hot chocolate, espresso, and any other brew you like. Next, we talk about money. How much the serving sets cost? Turkish serving sets can cost anything between $20 and $500. The price depends on a number of factors such as build quality, number of pieces included, materials used, the amount of details, and the amount of time spent to handcraft the set. Many of these excellent Turkish coffee serving sets are available for sale at great prices on Amazon and eBay! In fact, some of these prices are almost ridiculous because these are hand crafted sets. Believe it or not, you can get yourself a handcrafted set for under $100. Another good place to look for quality Turkish coffee serving sets is local antique stores. Here you can have hands on the set before you decide to buy it. Sometimes the sets available in the antique stores are much cheaper than those found online. So, we suggest you take your time and look for a high quality set that won’t cost you too much. Next, we move on to the reviews. We will start with The Bosporus 27-piece Turkish serving set. This amazingly looking coffee and espresso serving set can be described as being Arabic, Ottoman, and even Greek in style, however it originates from Turkey. This impressive twenty-seven piece coffee set is perfect for Turkish coffee and any other brew. The set is made by the well-known Bosporus Company which has been producing traditional serving sets for the last few decades. A 20” x 36” tea towel made of pure Turkish cotton. The set really looks amazing and will definitely help you impress your guests. However, it is worth mentioning this set is not just for showing off. The cups can hold two ounces of coffee, meaning they can be used for all sorts of brews. Now, let’s talk about money! You might think that this serving set would cost you a fortune, and you would be wrong. Believe it or not, this serving set can be found for as low as $80, depending on the place you shop. So, if you are interested in buying this set, please spend some looking for and comparing different sellers as this might save you a lot of money. To find out more about this set please read our full review of The Bosporus 27-piece Turkish coffee & espresso serving cup & saucer set. The Bosporus premium Turkish coffee & espresso serving set is a picturesque Turkish-style design espresso set for two. Unlike the previous set, this one packs only eleven pieces, making it an ideal option for those who don’t regularly host dinner parties and those who simply don’t have enough space for storing a larger set. The set is made of brown copper and brass. It is fully covered with decorative carvings and curves. This set weighs around three pounds and is available on Amazon and eBay for as low as $50. The set is really affordable, considering it is a handcrafted set that could last you a lifetime. If you decide to buy one online, we suggest you check the delivery fees to make sure you aren’t getting overcharged. Please visit our Bosporus premium Turkish coffee & espresso serving set full review to find out more about this set. Last but not least, we review The Turkish emporium’s copper Turkish coffee & espresso cup & saucer set. The Turkish Emporium’s copper Turkish coffee & espresso cup & saucer set is a single serving set made by Turkish Emporium Company. This set includes a plain porcelain insert, a copper base and lid, as well as a saucer and a complimentary tassel. As this set is so small, you can take it with you when travelling. Its size also makes it great for drinking espressos out of these. The price of $10 makes this set amazingly popular. The set can be ordered online from Amazon and eBay. With a shipping weight of only twelve ounces, you won’t have to spend a lot on shipping costs. Although this set is quite small, it is all you need to experience the beauty of Turkish coffee. To find out more about this set, please read our full review of The Turkish emporium’s copper Turkish coffee & espresso cup & saucer set. That’s it! It is now up to you to decide what serving set will suit you the best.